The city will not begin reconstructing Chatham Square this summer, after the unpopular plan drew months of criticism from the community and elected officials. The city insisted this week that the delay does not mean the $50 million project is shelved, but officials would not say when the work would start. Several Downtown politicians and community leaders said that the project is unlikely to move forward anytime soon. “I don’t think they’re going to do anything anymore,” said Justin Yu, chairperson of the Chinese Consolidated Benevolent Association. Yu met with D.O.T. Commissioner Janette Sadik-Khan and other high-level D.O.T. 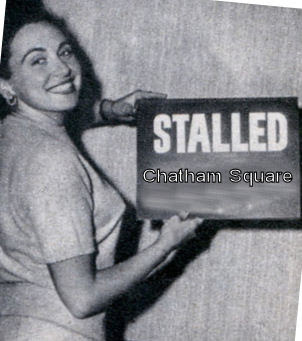 staff last week to discuss the Chatham Square plan. “Definitely she said they would reconsider it, review it,” Yu said of Sadik-Khan. Yu is one of many Chinatown leaders who oppose the city’s proposal for the complicated seven-way intersection. The city wants to realign the streets that feed Chatham Square, connecting East Broadway to Worth St. and the Bowery to St. James Place. The plan would cut Park Row out of the intersection, essentially making permanent the post-9/11 decision to close part of the street to protect One Police Plaza. Chinatown advocates spoke out against the city’s plan immediately when the city began pushing it late last year. The advocates were concerned that the city’s traffic and pedestrian improvements would be outweighed by the negative impact of the three-year construction on local businesses. When the city decided to move ahead with the reconfiguration anyway, residents and business owners banded together, holding rallies and gathering petition signatures. “I guess D.O.T. got the message,” Yu said. This week, the city acknowledged the delay in the project, but denied that anything beside the schedule had changed. “The project is not suspended or shelved,” said Scott Gastel, D.O.T. spokesperson. “We are working on some timing and coordination issues,” he added in an e-mailed statement. Gastel would not say when construction contracts would go out to bid or when work would begin. The city previously said it was essential for construction to begin this summer, so that the intersection would be able to handle an increased flow of cars during Brooklyn Bridge work starting next year. Gastel would not say how the Chatham Square delay would impact the bridge work. Assembly Speaker Sheldon Silver said in a statement that the reason D.O.T. is delaying the start of Chatham Square work is to coordinate it with the Brooklyn Bridge rehabilitation. Since the bulldozers won’t be arriving in Chatham Square anytime soon, Councilmember Alan Gerson said the community now has time to work with D.O.T. on a plan that makes everyone happy. Jan Lee, a Chinatown activist and owner of an antiques store, also was glad the project is on hold, but said it’s important to remain vigilant. Lee heard from a city official that D.O.T. is only delaying the project to avoid widespread protests during election season. If Mayor Mike Bloomberg gets re-elected in November, “this project starts the day after,” Lee said, based on what the city official told him. Lee hopes the delay will give the Civic Center Residents Coalition time to build support for their alternate plan, which would leave the intersection largely as is, reducing the project’s scope, cost and duration. The plan, endorsed by Community Board 3, would add a new one-lane road directly connecting St. James Place to East Broadway but would leave Park Row in its central position, in the hope that it will one day reopen. In a seven-page letter to C.B. 3 last month, Luis Sanchez, D.O.T.’s Lower Manhattan borough commissioner, said the community alternative plan would provide some relief to the traffic that snarls the intersection, but wouldn’t work as well as the city’s plan. Sanchez also said the city’s plan improves pedestrian safety and expands plaza space, while the community’s plan doesn’t. C.B. 3’s Chatham Square Task Force, which relied on the expertise of traffic consultant Brian Ketcham, also recommended that the city add a second eastbound lane to Worth St. In his May 1 letter, Sanchez agreed that widening Worth St. would improve traffic flow, and he said the city’s original plan included that. The city also wanted to add a third southbound lane to Bowery. But the problem is that widening the streets would cut into park space that has both state and city protections, Sanchez wrote. In late 2007, D.O.T. asked elected officials if they would support removing some park space for traffic improvements, and they did not support it, Sanchez said. Now, redesigning the intersection would require another five to seven months of work, Sanchez wrote. “It is simply too late to consider such a fundamental change to the design,” he wrote, although his letter was written over a month before the city delayed the project indefinitely. Gerson said Chatham Square’s current work delay gives the city more than enough time to get approval to remove a small amount of park space and redesign the intersection. Gerson supports demapping the park areas — which are basically concrete-topped plaza spaces — and he expects that it would take no more than a few months to do so, especially since the city is adding more park space in the design. Silver, who has a large say on whether the park space is demapped, has not seen any specific proposals and has not taken a position, said Caryn Adams, Silver’s spokesperson. In general, D.O.T. should work with the community to reach a consensus for Chatham Square, Silver said in a statement. Some Chinatown residents would prefer to leave the intersection as is. Steven Wong, chairperson of the Lin Zexu Foundation, is concerned the construction will hurt his Chatham Square translation business, and he does not want the work to disrupt the central plaza that features a statue of Lin Zexu, a 19th-century Chinese scholar and official. Before any work starts, Wong wants to see a detailed study of how the plan will improve pedestrian safety, so people “can walk across the street without fear of getting run over by cars,” Wong said. Congratulations to the Chinatown community's effort in beating back the onslaught of the bully boys at DOT and their handlers in Transportation Alternatives and their lackeys on Streetsblog. No one wanted this stupid proposal except DOT commish Sadik-Khan, the chief bully, and her little hipster friends from Brooklyn who control the show at DOT nowadays. Congrats also to the community board for standing by the neighborhood residents and businesses in beating back this assault. You put Sadik-Khan in her place! Let her go back to Times Square and cater to the needs of the tourists there. She and her minions are not welcome downtown. in Dec. of 2008 people who did not live in Chinatown, didn't own businesses in Chinatown, and never attended the numerous meetings with the D.O.T. on this subject decided - after seeing the D.O.T. produced drawings of the proposed Chatham Square reconstruction for less than a week to have a "call to arms" for NYC to go against the Chinatown community with a blog posting entitled : "Oppo Expected to Improvements for Chatham Square, Park Row by Brad Aaron on December 1, 2008" justifying the "call to arms" with nothing more than "Unfortunately, the proposal -- a joint project of Parks, City Planning, Design and Construction, and DOT -- is likely to draw opposition from those who consider auto traffic key to Chinatown's prosperity. As always, turnout by livable streets advocates is key.". It is SO sad that this kind of impulse to REACT against communities who are trying to cope with plans that THEY had to fight to get released for review without the AID of a professional engineer. Pedestrian safety was and always has been paramount to the Chinatown community as well as economic viability. ANY time that new comers to NYC decide to have a "call to arms" against the communities of NYC, acting like soldiers of the D.O.T. who have drunk deep of the "green" koolaid, we must rise up against them and remind the public officials , as was done with Chatham Square in this instance, that WE ARE NEW YORK, not these reactionary newbies.